Reference number for this case: 2-oct-54-Dax. Thank you for including this reference number in any correspondence with me regarding this case. Field investigators and ufologists Lestage and Barret learned about this case 17 years after the facts and had the possibility to interview the witnesses, whose memories were scarse but interesting. On October 2, 1954, in the afternoon, Mr. and Mrs. Laussucq worked in the fields in the surroundings of Sarthou, in the vicinity of the city of Dax. They were in company of their farm workman, Mr. Dumey. A brilliant gleam suddenly drew their attention. They then observed a formation of five cylinders, aligned vertically and moving in the sky. The five cylinders were in lined in parralel one to each other, the one in the middle was slightly longer than the others and oscillated slightly. The objects reflected the sun on their surface of white metallic aspect. There had been no noise nor contrail or smoke while the formation moved in straight line towards the West. The witnesses followed this displacement during a few minutes, the objects being gradually lost from sight as they went away towards the west in the direction of the ocean. Luc Chastan indicates in his database that in the Landes in Dax on October 2, 1954, at an unknown hour, in the afternoon, a couple worked in the fields in the surroundings of the Sarthou, a suburb of Dax. They were in company of their farm worker. A brilliant gleam suddenly caught their attention. They then observed a formation of five cylinders, aligned vertically and moving in the sky. The five cylinders were in parallel aligned the ones with the others, the one in the middle was slightly longer than the others and oscillated slightly. The objects reflected the sun on their surface of metallic aspect. There had been no noise nor wake while the formation moved in straight line towards the West. The witnesses followed this displacement during a few minutes, the objects being gradually lost sight of the fact towards the West in direction of the ocean. 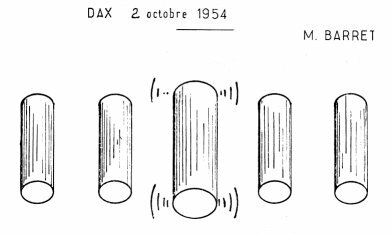 The website indicates that on 2 October 1954 in Dax, France, there was a UFO sighting. Not looked for yet. Probable planes. [pc1] Private communication to the author of this site, 2003. 0.1 Patrick Gross September 22, 2003 First published. 1.0 Patrick Gross February 27, 2009 Conversion from HTML to XHTML Strict. First formal version. Additions [lc1], [ud1]. 1.1 Patrick Gross January 2, 2017 Addition [ub1].